With nearly 300,000 followers in Iran, the Bahá’ís make up Iran’s largest minority religious group. With Iran as its birthplace, the Bahá’í Faith has become a global religion with followers in over 200 countries. But its followers in Iran are target of systematic abuse by a deeply ideological power structure that politicizes every aspect of life in Iran and sees religious minorities and their belief systems a threat to its ideologically-built power base and control system. In the past few years, the persecution of the Bahá’ís has gained momentum with increase in the number of the imprisoned. In early 2011, there were about 56 Baha’is in prison. Today, it has swelled to 116. Anthony Vance, Director of Public Affairs for the Baha’is of the United States, draws attention to the fact that abuses against the Bahá’í community in Iran became more pronounced under the presidency of Mahmoud Ahmadinejad. “Gradually, after his election, the country began to take a more intolerant stance towards Baha’is. For several years prior to his election, the number of Baha’is in prison was typically in single digits,” states Mr. Vance. H. Res. 134 calls attention to the state of imprisoned religious leaders, in particular the seven Bahá’í leaders currently serving a 20-year sentence (pictured above). 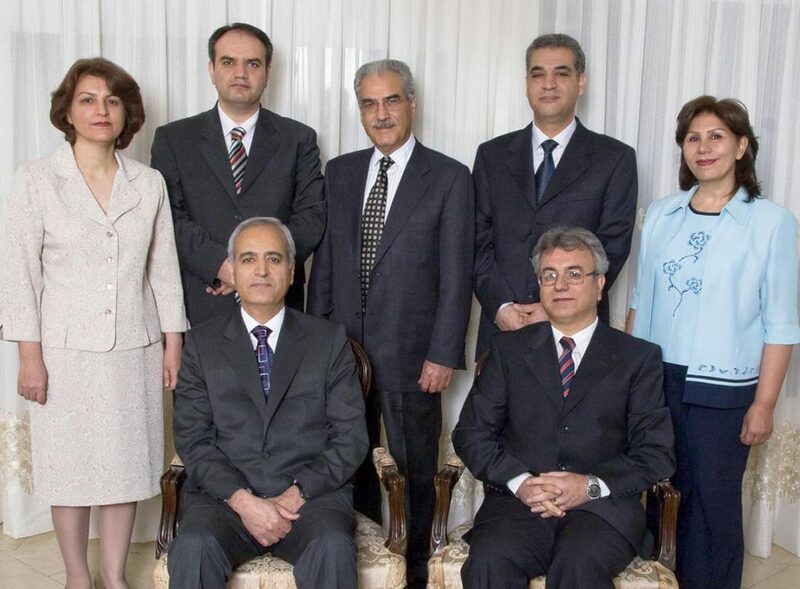 This unfortunate group of five men and two women is part of a national Bahai’ organization known as “Yaran’e Iran” (friends of Iran) and widely known to have been incarcerated under appalling conditions, including psychological and physical pressure. One of the intended goals of such resolutions is to demonstrate to the Iranian leadership that they are held accountable for their abuse of religious minorities and their persecution in Iran. According to Mr. Vance, “one could expect that the continued media exposure and condemnation by governments like the United States and its friends and allies, will mitigate the severity of the treatment of the prisoners.” He further states that in the mid ‘80’s with mounting international pressure on Iran the pace of execution of Bahá’ís dropped dramatically from their high numbers during early days of the revolution. Ms. Monir Khanjani and Mr. Naim Sobhani, both Iranian-American Bahá’ís and based in Washington D.C., have firsthand knowledge of what it means to be a Bahá’í in Iran. Ms. Khanjani, whose uncle, Jamaloddin Khanjani, is among the seven imprisoned religious leaders and part of “Yaran’e Iran”, talks about her own ordeal before migrating to the United States. “We could not open businesses, or attend college. At elementary school, I was ridiculed and made fun of by some of our teachers for being a Bahá’í. We were also branded as traitors and anti-revolutionary. Other students were encouraged to distance themselves from us”, remembers Ms. Khanjani of her early school years in Iran. She also states that in addition to her imprisoned uncle, two of her cousins, Leva and Foad (grandsons of Mr. Khanjani), are also in prison. For Mr. Sobhani, who suffered similar abuses and discrimination in Iran, the Iranian government is astonishingly insecure and paranoid against the Bahá’ís and other religious minorities because of the faith’s key principles that are based on respect for human rights and gender equality. Mr. Sobhani believes there are theological issues at play that make Iran’s leadership so sensitive against the Bahá’í faith and those issues chiefly stem from the Shiite’ clergy’s claim that there is no religion after Islam and that Islam is the last religion. Mr. Sobhani, whose father, Riaz Sobhani, is currently serving a four-year term in prison for simply supporting and organizing education sessions for Bahá’í students, states that the regime systematically tries to tarnish the image of the Bahá’í community on fabricated charges such as spying for foreign powers, conspiring to overthrow the regime, and disrespect for Islam. H. Res. 134 was passed with strong bi-partisan support. Of the 146 representatives co-sponsoring the resolution, 78 were Republicans and 68 were Democrats. Congressman Robert Dold (R-Illinois), who introduced the resolution stated that “the Congress has sent an important signal to the parliaments and foreign ministries of friends and allies abroad to speak out for the human rights of Bahá’ís and all oppressed people in Iran”.